This tour guide takes us to southeastern Iowa, where we have not only one but six bridges in the area where Harvey and Tracy are located. One mystery bridge, one extremely haunted one carrying a dead end low maintenance road, one railroad bridge that had a tragic end, another railroad bridge that was located next to a sunken ferry and two abandoned ones that are being considered for a bike trail. All of them span(-ned) the Des Moines River within a 10-mile radius of a small town of Harvey. Located approximately seven miles east of the county seat of Knoxville in Marion County, Harvey has a population of roughly 250 inhabitants. Judging by the appearance of the houses and even the two churches, the town had seen its better days, as the majority of them live at or below the poverty line and most of the buildings are run down, the yards littered with junk needed to be removed if the assistance is available. It doesn’t look any better for the town of Tracy, located three miles down river in Mahaska County. The town of 150 inhabitants had once seen better days with the railroad in business, connecting it with Oskaloosa, which is 10 miles to the east and the county seat. But looking at Harvey, these characteristics are only scratching the surface, as the town, and the surrounding area, and the crossings along the Des Moines River are all haunted in one way or another. Photographing the bridges, there is a sense of eeriness that makes a person stay close to the car and not wander off, fearing that he will not return. The region used to be bustling with railway and commercial traffic in the 1800s and early 1900s. In fact, Harvey was plotted in 1876 by the railroad with a line passing through later that year, connecting Knoxville and points east through the Chicago, Burlington and Quincy. But the line that passed through Harvey was abandoned, and one by one, commerce moved away to nearby towns, but leaving traces of the past in the forms of ghosts and other paranormal activity that makes the region haunted, but researchers curious about its history. If there is a word of advice I have for the passers-by it is this: Never travel alone in the dark, for you are being watched. Travel in groups and in the day time to ensure that you are safe and sound. Make sure you do not wander off away from the cars, and never ever get lost when photographing in the area! On one of the evenings in August of 2011, I took a tour of the region and its bridges. There were five historic truss bridges that I found and spent some time photographing them: The Horn’s Ferry, Wabash Railroad, Harvey Railroad, Belle Fountain, and Eveland Bridges. While the Horn’s Ferry Bridge has a topic of its own (click here), the primary focus of this tour is on the other four bridges. In addition to that, there is an abandoned highway that used to pass through Harvey in a form of Iowa Highway 92, the same highway that used to crisscross Madison County, and its numerous covered bridges that existed (now there’s only six fully restored structures). It snaked its way towards the Des Moines River before crossing north of Tracy. The highway was straightened and bypassed in 1978 but numerous questions remain about the highway. And lastly, east of Tracy is the remains of a railroad bridge which has a history of its own, including that of its tragic end 60 years ago. The first bridge on the tour is one of two that used to be a railroad crossing but was repurposed to serve cars. The Wabash Railroad Bridge can be found spanning the Des Moines River just south of the present crossing at Keokuk Drive (CSAH T-17). It was built in 1881 by the Oliver Iron and Steel Company, even though it is unclear whether it was the company that had been operated by Henry Oliver in Pittsburgh or James Oliver in the state of Indiana. 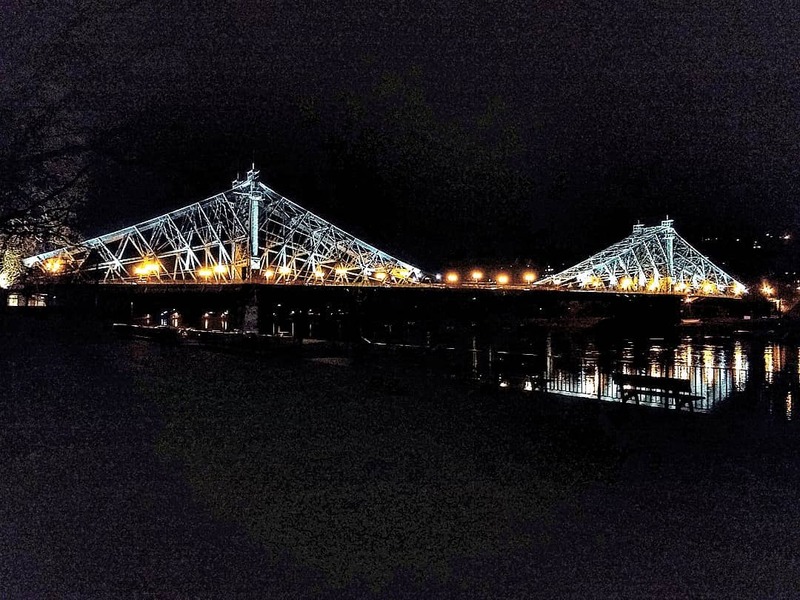 It consists of three Pratt through truss spans with pinned connections and Lattice portal bracings. The overhead bracings are V-laced with 45° heel supports. The center span was replaced in 1905. The total length is 545 feet long, meaning three 150-foot long spans plus an approach constructed in 1951 when it was converted to vehicular traffic. The Wabash Railroad was created in 1837 but started using the name out of the creation of several small railroads in 1865. The company served the Midwestern states which included an area between Kansas City and St. Louis to Chicago, Detroit, parts of Ontario and ending in Buffalo. This included the line going through Harvey and Tracy enroute to the Quad Cities (E) and Omaha (W). After its receivership in 1931 and purchase by the Pennsylvania Railroad in 1933, several tracks were sold off, including this line and the bridge, which Marion County purchased in 1946. The bridge was eventually converted to a vehicular crossing by 1951 and the line was turned into a gravel road connecting Harvey and Oskaloosa. The bridge was bypassed by a newer crossing in the late 1980s but remained a crossing as a gravel road until its closure a few years ago. Today, it is a pedestrian crossing with each ends being barricaded and steel fencing having been installed. Plans are in the making to include the crossing into the bike trail network connecting Pella and Van Buren County. In 2013, the remains of an antique ferry boat were found 500 feet south of the crossing. It is possible that a ferry used to serve locals during the time the Wabash Railroad was in service, but more information is needed to prove these claims. The Wabash folded into Norfolk and Southern in 1991, ending its storied 153 year run. Built in 1878 by the American Bridge Company, this four-span Pratt through truss bridge was one of the first bridges that featured the bridge company’s signature portal bracings (as you can see in the pictures below). They were used often for railroad crossings with most of them built after the consolidation of 26 bridge companies in 1901. The bridge served rail traffic until it was abandoned in 1938 and purchased by the county, which then converted it into a roadway bridge. At some time later, the Des Moines River was re-channeled making the road expendable. Yet it still serves this dead end road to nearby farms along the river today. The railroad that used the bridge was the Rock Island, which started its decline at the time the bridge and the line were sold off and was eventually liquidated in 1980. The bridge is surrounded by thick trees, which covers the structure and makes the tall and narrow structure a haunted place to visit. During my visit to the bridge, the first impression after looking at the entrance was that of walking through a dark black hole filled with bats, owls, and creepy insects. Crickets were already out in full force chirping away. Everything else was deathly still as I was crossing the structure, taking pictures of it. Yet as I was at the easternmost portal entrance to the bridge, I heard gunshots ringing out from the opposite end of the bridge. The first shot did not stir me but it did scare off the birds that had been dining in the nests. The second shot however made me rethink my stay on the bridge as there was speculation that someone was shooting at me (or trying to). There was no one approaching me on the bridge and no other people in the vicinity of the structure. The third gunshot was the final signal for me to make my exit as I rush towards the car, hearing more gunshots along the way, got in and took off. As I was leaving, a party of two people on an ATV rushed onto the bridge. If this was a way of shooing someone from the bridge just so they could have it, then they could have done better than that. Yet even if no guns were being used, the bridge is probably one of the most haunted structures you can ever cross, ranking up there with the Enoch’s Knob Bridge in Missouri. The best time to visit the bridge is in the daylight, where you can get the best pics and are most likely not be frightened by spooky creatures and guns going off without knowing where it came from. Among the four being profiled here is another mystery bridge- the first in Mahaska County, Marion’s neighbor to the east. The first time this crossing came to my attention was on a GoogleMap, where there are two crossings bearing the name Hwy. 92- the present one in Marion County and what is left of the previous crossing on the Mahaska side, approximately 1.5 miles south of the present crossing. The road approaching the previous crossing is still in its original form- concrete from the 1930s and really narrow. Yet when arriving at the crossing, it is barricaded with signs and broken down excavators on each end, with the road turning to the south and becoming gravel. Another piece of evidence to be presented was the fact that a US geological survey map of the 1930s indicated that the crossing consisted of four spans and a truss design, similar to a Parker design. And lastly, National Bridge Inventory records indicated that the present Hwy. 92 bridge on the Marion side was built in 1978. Given the fact that the Belle Fountain Bridge is located a half mile downstream, it is possible that the Old 92 Bridge was removed as it was deemed expendable and obsolete. Yet we do not know whether it is true or not. What we do know is there are many questions that need to be answered about this bridge, such as: 1. What did the old bridge look like? Was it a Parker truss bridge or another truss type? 2. When was the bridge built? Who built the structure? and 3. When was the bridge removed? Was it in 1978 or afterwards? And why was it removed? This bridge is located in a small unincorporated village of Belle Fountain, located 1.5 miles south of Hwy. 92 on the west bank of the Des Moines River. It is one of the earliest bridges built by a prominent bridge builder in Iowa, the Clinton Bridge and Iron Works Company, which built the structure at a cost of $9750 in 1898. The four-span Pratt through truss super-structure features A-frame portal and strut bracing and pin connections, the former of which was recently introduced to replace the Lattice portal bracing. The bridge is 595 feet long with each span being 145 feet. The bridge has been a subject of neglect, especially after the Old 92 Bridge was built in 1930 and located 0.5 miles upstream. The lack of maintenance of the structure for unknown reasons prompted its closure. Since then the truss bridge has been allowed to remain in place with the flooring rotting away to expose the bottom chord. However, given the awareness of the bridge and its historic significance and connection with Belle Fountain, interest is being garnered in restoring the bridge and reincorporating it into a bike trail. When and if that will happen remains to be seen. One of the factors to keep in mind is to rid the bridge of the overgrowth, which has been ruling the eastern truss bridge for some time, as you can see in the photos. Given the fact that the bridge has been sitting abandoned for a long time, it is possible that the bridge may have to be disassembled, with the parts being sandblasted and replaced, and the foundations being rebuilt, before reassembling it back into place. The cost for the whole work would be a fraction of the cost for replacing the bridge outright. Having a restored bridge like this one would be a blessing for the community and the county, which seems to have embraced preservation given the importance of this bridge. The next bridge on the tour is the Eveland Bridge. Like the Belle Fountain Bridge, this bridge replaced a ferry that was used to cross the river. It is perhaps the only bridge originally built by a bridge company in Indiana, the Fort Wayne Bridge Works, which built the foundations in 1876 and erected the three-span truss bridge in the spring of the following year. It featured three spans of the Whipple through truss with the portal bracing representing the exact truss design. The structure was made of iron and featured pin-connections. Flooding wiped out the center span in 1903 and was subsequentially replaced with a pin-connected Pratt through truss bridge made of steel. Since its closure in the early 1990s, it has sat in its place waiting to be reused, but not before replacing the decking (which has rotted away substantially) and possibly reconstructing the trusses. Photographing the bridge is really difficult as both sides of the river are heavily forested with the southern bank being littered with trailer homes and small houses. It also does not present a welcoming feeling when driving past the structure, especially as there are many dogs roaming around, waiting to chase the next person away from the area. With a lack of lighting in the area, it is especially creepy at night when driving, let alone walking. But nevertheless, I took advantage of the little daylight that was left and got a pair of pics before anything unusual happened, and then drove back to the hotel in Des Moines, which was a good hour’s drive away. Like the Belle Fountain Bridge, the Eveland may be getting a new lease on life, as plans are in the preliminary stages to convert the bridge into a bike trail. Given its remote location, the whole area surrounding the bridge may benefit from having a bike trail pass through, as business and other services could be established to serve the bikers and tourists. It will also mean more lighting in the evening for those going on an evening stroll, something that this area and the bridge itself need very badly. It all depends on the costs, the interest and the question of what can be realized and what can be scrapped. The last bridge on the tour is one with a long history- and one that ended in tragedy. The Tracy Railroad Bridge consisted of two Whipple through truss spans with an X-frame portal bracing, all being pin connected. The bridge was originally built in 1882 by George S. Morrison for the Chicago, Burlington and Quincy Railroad (later became part of the BNSF Railways), spanning the Missouri River near Plattsmouth, Nebraska. Three bridge builders were behind the construction of the bridge, one of which- Keystone Bridge Company in Pittsburgh- had a hand in relocating and rebuilding the bridge at Tracy in 1903 for the Minneapolis and St. Louis Railroad. This was part of the plan to build a sturdier three-span Pennsylvania truss bridge at Plattsmouth while the 1882 bridge was needed for the line at Tracy. From 1903 to its removal in 1950, the bridge was located over the Des Moines River near the site of present-day Cedar Bluffs Natural Area, while the line connected Eddyville with Knoxville. After many years of disuse, workers in 1950 dismantled the structure and sold the parts for scrap. But it came at a price of one life, for one person was crushed to death as the eastern span fell thirty feet into the river. Another person was on that bridge and jumped into the river as it fell. He suffered only minor injuries. The accident happened after the western half of the bridge was removed. The rest of the eastern half was pulled out of the water and hauled away by another demolition company, months after the incident. The Tracy Bridge was a work of art of one prominent bridge builder, yet its life ended on a sour note, even though had the preservation movement started after World War II, there might have been a chance for this bridge, just like its neighbors to the north. It will be interesting to see what the future brings for the bridges in the greater Harvey area. Plans are in the making for a bike trail network going from its terminus at the Horn’s Ferry Bridge to Eddyville, possibly using the crossings for cyclists to pass through. This will bring a new lease in life for the ones that have been unused for a long time but whose history can be contributed to the development of the infrastructure in the state of Iowa over the past 150 years. And while it will take up to seven years to finalize the plans and actually build the network, when it is completed, people will take advantage of the trail and learn about the history of each village and bridge they pass by. And even if some of the bridges are haunted, it is unlikely that anyone will actually be taking the trail at night, unless they are as gutsy as I was when visiting the bridges last year. But it is a sure bet that safety features, including lighting, will be considered to accommodate those who dare to encounter the paranormal at night. As for the towns of Harvey and Tracy, the coming of the bike trail may help turn things around for a community that had seen its better days. Having the trail will boost commerce, like it did during the days of the railroad. And with that will bring good fortunes for the community, something that the people surely have been waiting for that for a long time and owe themselves to that share of the pie of prosperity. A map of the bridges can be seen here. Should you be interested in helping out with the bike trail project in one way or another, please contact the county conservation board, historical societies and other groups involved and see what you can do for them. I have a picture of the old 92 bridge if you are interested. It was severely damaged during the flood of 1947 and repaired. The bridge was was removed in 1980 but I believe it was closed as soon as the new one was built.